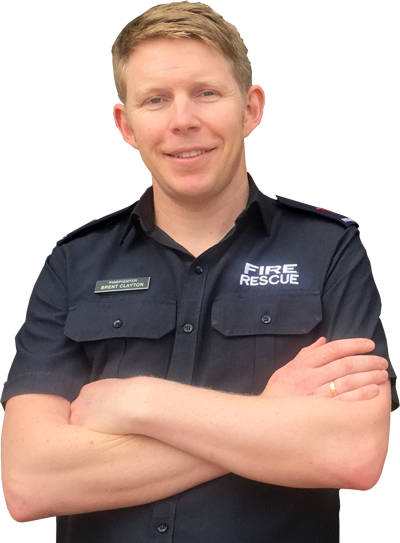 My name is Brent Clayton and I am an active firefighter and the Founder of Fire Recruitment Australia. After becoming a firefighter, I developed a massive interest in the Fire Services Recruitment Process and Selection Processes. Since 2007, I have been working on thoroughly learning how Fire Services Recruitment works, testing ways to help people get the edge over the competition and helping many people do exactly that for services in every state of Australia. The result of all this hard work is my Fire Recruitment Australia Membership program as well as some best-selling eBooks and eCourses. I've made it my mission to help people who are in the same position I was in, so you don't have to waste years of your life finding out the hard way. Before becoming a firefighter I was a Prison Guard for a number of years, and in the military prior to that. All these jobs require a developed knowledge of recruitment and selection processes which I have mastered over the years — being a successful applicant myself in areas where many fail. Along the way I've also had the great fortune of meeting and making friends with many recruitment and selection process professionals who have added to my knowledge. They have been especially useful in learning to mentor individuals and write specific guides to help people reach their goals in these areas. I started out by selling the Firefighter Recruitment Bundle and offering one-on-one coaching sessions to aspiring firefighters. Today I have a full-fledged membership site that offers every form of Fire Service recruitment training you can imagine. those who want to avoid wasting time and put their best foot forward. If you're one of those people, check out what services I have to offer that can help you reach your goal. ​Which is exactly why I started a membership program for aspiring firefighters. When you join, get direct access to me, Brent. My proven systems and expertly designed programs are here to help you get the absolute best of everything on your journey towards becoming a professional firefighter in Australia. This is ideal for you if you would like to see success much more quickly and with less stress. Are You SURE You're Ready to Take On the Demanding Physical Ability Test? You're going to need a lot of strength, agility, and endurance. My Physical Ability Accelerator shows you how to train smart for rapid fitness improvements. I want my FREE Accelerator!